No other beverage can lay claim to as many health benefits as green tea. The Chinese have been using green tea as a medicine for over four thousand years. They use it to treat everything from a mild headache to chronic depression. Studies reveal that consuming green tea reduces the risk of esophageal cancer by nearly sixty percent. This is because of a particular compound which aids in inhibiting the growth of cancer cells. Green tea also helps in lowering the cholesterol levels. Green tea is rich in catechin polyphenols, most particularly in epigallocatechin gallate (EGCG) which happens to be a powerful antioxidant. Apart from retarding the growth of cancer cells, it also kills them without harming healthy tissue. Apart from this, it also inhibits the abnormal formation of blood clots. It’s common knowledge that thrombosis or this abnormal formation of blood clots is the main culprit behind heart attacks and stroke. When green tea is processed, the green leaves are steamed, which prevents the compound EGCG from being oxidized. There is new evidence that suggests green tea can even help dieters. A combination of caffeine and green tea extract is found effective in burning up more calories. Drinking green tea can even help to prevent tooth decay. Its bacteria destroying powers help prevent food poisoning as well as annihilate the bacteria which cause dental plaque. Revering back to the subject of cancer and green tea, studies conducted on women with breast cancer advised to consume green tea in plenty before and after surgery. These women were found to have lower recurrence of cancer. Increase your daily intake of green tea to two cups and reduce the risk of developing lung cancer, stomach, prostate and pancreatic cancers. Heartening news for dieters and very obese people- drink green tea and lose weight naturally. The caffeine in green tea helps in oxidation of fat. Experts opine that drinking green tea daily boosts your metabolism from eight to fourteen percent and this is a great way to lose weight. Take a tip from health experts who claim that exercise and green tea consumption together helps you to get your body in shape. Be the envy of your friends by starting to look years younger and energetic. Drinking green tea is not only economical but also cent percent natural in content too. It’s much cheaper than other weight loss supplements available over the counter. Green tea has anti oxidants that protect you from free radicals and slows down the ageing process, making you look years younger than you really are. The herbal ingredients in green tea help to cleanse your system of bacteria. Making it a habit to drink green tea regularly helps your body to fight infections. It increases the immunity of the body and strengthens its ability to fight diseases. Further studies reveal that green tea aids in lowering blood pressure and also helps people suffering from asthmatic conditions. This is because green tea contains theophyline which assists the muscles surrounding the bronchial tubes to relax, thus helping an asthmatic patient to breathe easily. This wonderful green tea originates from Asian countries, including Japan and China. The leaves are plucked and usually steamed, rather than boiled. At times, green tea leaves are even dried and converted to powder form, ready to be used in baking, cooking and even utilized for making supplements in the form of tablets or capsules. Apart from possessing antioxidant properties, green tea contains caffeine, theanine, amino acids, catechin, chlorophyll, butyric acid, Vitamins A, B, C and minerals which include saponin, saccharides and pectin. Green tea encourages growth of strong nails and hair. It also eliminates problems with cavities and bad breath. This wonderful drink is used in treating multiple sclerosis too and is used to stop or retard Alzheimer’s and Parkinson’s disease. 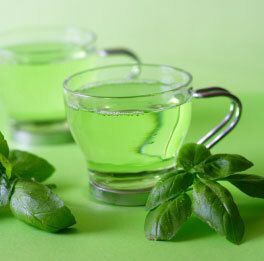 By consuming green tea regularly, the body is cleansed of toxins that cause a lot of health issues. You start feeling good, relaxed, full of energy and even develop a positive attitude to life. If you feel that you are in for a bout of cold and the flu, gargle with green tea thrice a day and observe you feeling immensely better. The Japanese attribute their good health and longevity to green tea. Damage to endothelial cells caused by addiction to smoking can be reversed by drinking green tea. There are several people all over the world who suffer from sleep apnea, a disorder that literally prevents a person from breathing while sleeping, sometimes for a minute or longer. This can seriously deprive the brain of oxygen causing brain damage and memory loss. People afflicted with obstructive sleep apnea exhibit changes in their brain tissue in areas related to learning and memory. Natural substances in green tea can help stave off the deficits. Using green tea prevents and retards brain damage due to hypoxia and can prove to be an important aid for preserving memories of millions suffering from sleep apnea. A cup of green tea has a light and delicate flavor and it perfectly complements breakfast, lunch and dinner. The caffeine content in green tea is lesser than in other caffeinated beverages. It is just enough to get you an energy boost, helping to tide over that late afternoon hump. Next time you stride over to the coffee machine at office, consider pouring yourself a hot cup of water and dipping in the goodness of a bag of green tea. You would be doing yourself a great favor! Recent research studies reveal that there is a strong correlation between anti oxidants found in green tea and the functioning of the liver. Liver is the most important organ acting as a filter to rid the body of toxins. We inflict a lot of harm on the liver when we consume alcohol, smoke cigarettes, breathe in impurities and partake of harmful chemicals through food and water. Green tea offers protection to the cells of the liver and stimulates and strengthens the immune system, as a whole. Does hair loss bother you? There is evidence to prove that green tea influences the levels of hormone circulating in the body, particularly testosterone and enhances hair growth. Brew your way to good health through daily cups of delicately flavored and delicious green tea. Have it hot, have it cold, and if you dislike the taste of green tea alone, use honey to sweeten it, which is brimming with immense goodness to boost your health, energy and vitality.